It’s finally time to start crocheting the Southern Diamonds Shawl! Last week we discussed the supplies you would need to get started, so I’m hoping you are ready to get “hooking”! Ch 4, join to first ch by sl st to form a ring. If you have any questions, please let me know. You can send me an email but clicking on the contact button in the menu at the top of the page! It’s my very first CAL (crochet-a-long), and I’m so excited. When I saw that Elena (Beatrice Ryan Designs) posted about hosting a CAL, I thought it would be a great idea. Her choice is an afghan and other than the first week’s details, I have no idea what it’s going to look like in the end. Personally, that’s one of my favorite parts of the CAL. I’ve seen Elena’s work and trust this blanket will be gorgeous. I must confess that one of the main reasons for joining the CAL is that I need a blanket done by April. My daughter-in-law will be having Ella in April and of course, I must give her something handmade from her nana. I have a tendency to slightly procrastinate (ok, well maybe more than slightly), and this CAL will be perfect for keeping me on task. We received the first set of instructions from Elena this past Saturday. 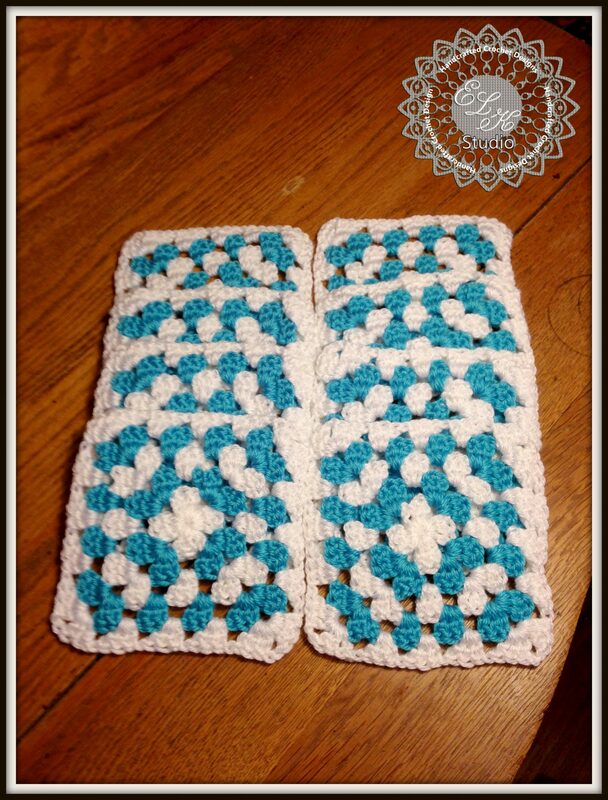 The pattern was for 8 granny squares using any number of colors or themes. I chose to use only 2 colors (turquoise and white) of the Red Heart Soft yarn. It seems to be my yarn of choice lately, and I’m loving the blanket so far! I’ll be heading over to Elena’s page this evening for the instructions for this week and hopefully make some progress. I’m sure it’s not too late join if you’d like! Just head over to Beatrice Ryan Designs and look for the CAL tab at the top of the page! Every Friday evening we will post our progress on her Facebook page for everyone to see. Yesterday was tons of fun and there was creativity everywhere! I’ll be posting my progress again next week so stay tuned!